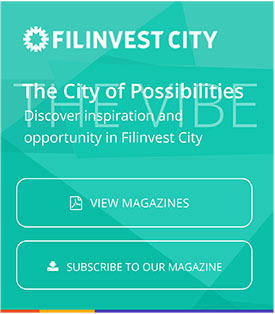 Filinvest City effectively captures the vibrant mood of the summer season through its fun selection of activities and events that cater to all ages and interests. Just in time for the observance of Fire Prevention Month, Filinvest City staged its first Fire Olympics last April 23, 2016. Aside from being educational, this special event also served as a friendly competition among members of Filinvest City’s Locators Emergency Response Team. Gather your friends and loved ones and escape to Filinvest City this summer! Filinvest City bagged the Best Mixed-use Development Philippines award in the Asia Pacific Property Awards 2016 last Friday, April 8 at The Shangri La Hotel Kuala Lumpur in Malaysia. Highly prized for the breathing space and visual relief they offer to urban residents, parks and green open spaces allow surrounding communities to command higher values. Rising next to Festival Mall’s River Park highlighted by outdoor activities, the Parkway Place neighborhood in this southern metropolis is expected to merit higher property prices with the recent completion of the park.